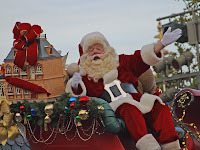 Santa Claus will be in Leonia today between 12:30 and 2:30 at Dante's Place an Italian restaurant located at 373 Broad Ave.
Come in for Lunch and get a picture with Santa. You are welcome to bring your own camera. The Rutherford Holiday Festival is a joyous kick off to the winter holiday season. The Holiday Festival begins at 9:00 Am and runs throughout the day. There will be a tree lighting at the library and Story time with Santa and Mrs. Claus (Twas the night before Christmas) The program will be held in the library auditorium at 4:30 pm. * The Night Before Christmas reading by Santa at the Rutherford Public Library.